No, this isn't a make-believe place. It's real. They call it "Ball's Pyramid." It's what's left of an old volcano that emerged from the sea about 7 million years ago. A British naval officer named Ball was the first European to see it in 1788. It sits off Australia, in the South Pacific. It is extremely narrow, 1,844 feet high, and it sits alone. What's more, for years this place had a secret. At 225 feet above sea level, hanging on the rock surface, there is a small, spindly little bush, and under that bush, a few years ago, two climbers, working in the dark, found something totally improbable hiding in the soil below. How it got there, we still don't know. 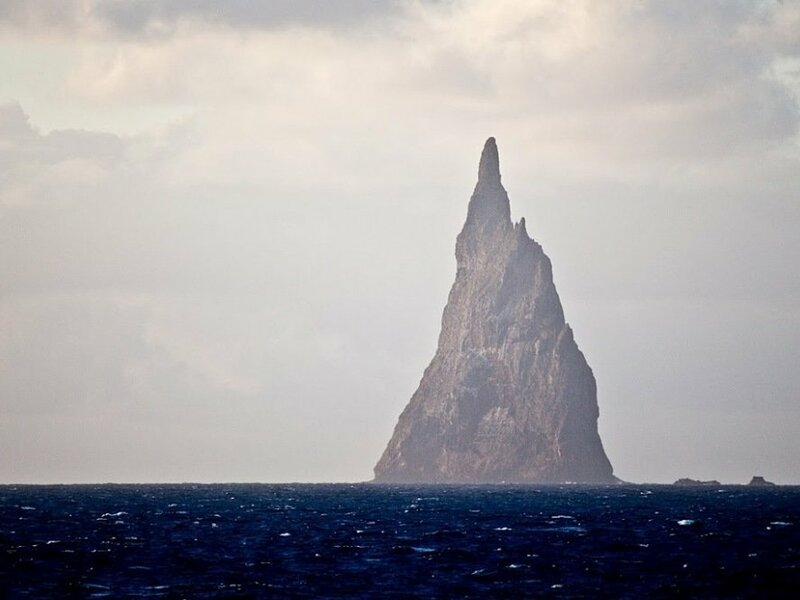 Here's the story: About 13 miles from this spindle of rock, there's a bigger island, called Lord Howe Island. On Lord Howe, there used to be an insect, famous for being big. 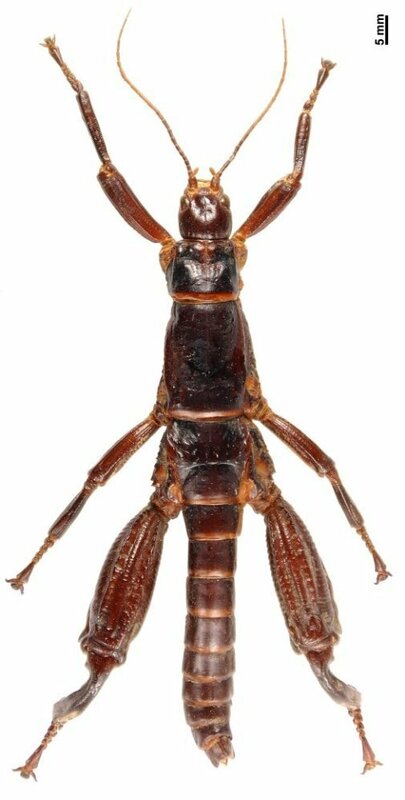 It's a stick insect, a critter that masquerades as a piece of wood, and the Lord Howe Island version was so large — as big as a human hand — that the Europeans labeled it a "tree lobster" because of its size and hard, lobsterlike exoskeleton. It was 12 centimeters long and the heaviest flightless stick insect in the world. Local fishermen used to put them on fishing hooks and use them as bait. Then one day in 1918, a supply ship, the S.S. Makambo from Britain, ran aground at Lord Howe Island and had to be evacuated. One passenger drowned. The rest were put ashore. It took nine days to repair the Makambo, and during that time, some black rats managed to get from the ship to the island, where they instantly discovered a delicious new rat food: giant stick insects. Two years later, the rats were everywhere and the tree lobsters were gone. Totally gone. After 1920, there wasn't a single sighting. By 1960, the Lord Howe stick insect, Dryococelus australis, was presumed extinct. There was a rumor, though. Some climbers scaling Ball's Pyramid in the 1960s said they'd seen a few stick insect corpses lying on the rocks that looked "recently dead." But the species is nocturnal, and nobody wanted to scale the spire hunting for bugs in the dark. Fast forward to 2001, when two Australian scientists, David Priddel and Nicholas Carlile, with two assistants, decided to take a closer look. From the water, they'd seen a few patches of vegetation that just might support walking sticks. So, they boated over. ("Swimming would have been much easier," Carlile said, "but there are too many sharks.") They crawled up the vertical rock face to about 500 feet, where they found a few crickets, nothing special. But on their way down, on a precarious, unstable rock surface, they saw a single melaleuca bush peeping out of a crack and, underneath, what looked like fresh droppings of some large insect. Where, they wondered, did that poop come from? The only thing to do was to go back up after dark, with flashlights and cameras, to see if the pooper would be out taking a nighttime walk. Nick Carlile and a local ranger, Dean Hiscox, agreed to make the climb. And with flashlights, they scaled the wall till they reached the plant, and there, spread out on the bushy surface, were two enormous, shiny, black-looking bodies. And below those two, slithering into the muck, were more, and more ... 24 in all. All gathered near this one plant. They were alive and, to Nick Carlile's eye, enormous. Looking at them, he said, "It felt like stepping back into the Jurassic age, when insects ruled the world." They were Dryococelus australis. A search the next morning, and two years later, concluded these are the only ones on Ball's Pyramid, the last ones. They live there, and, as best we know, nowhere else. How they got there is a mystery. Maybe they hitchhiked on birds, or traveled with fishermen, and how they survived for so long on just a single patch of plants, nobody knows either. The important thing, the scientists thought, was to get a few of these insects protected and into a breeding program. That wasn't so easy. The Australian government didn't know if the animals on Ball's Pyramid could or should be moved. There were meetings, studies, two years passed, and finally officials agreed to allow four animals to be retrieved. Just four. When the team went back to collect them, it turned out there had been a rock slide on the mountain, and at first they feared that the whole population had been wiped out. But when they got back up to the site, on Valentine's Day 2003, the animals were still there, sitting on and around their bush. The plan was to take one pair and give it a man who was very familiar with mainland walking stick insects, a private breeder living in Sydney. He got his pair, but within two weeks, they died. "Eve became very, very sick. Patrick ... worked every night for a month desperately trying to cure her. ... Eventually, based on gut instinct, Patrick concocted a mixture that included calcium and nectar and fed it to his patient, drop by drop, as she lay curled up in his hand." Her recovery was almost instant. Patrick told the Australian Broadcasting Company, "She went from being on her back curled up in my hand, almost as good as dead, to being up and walking around within a couple of hours." Eve's eggs were harvested, incubated (though it turns out only the first 30 were fertile) and became the foundation of the zoo's new population of walking sticks. When Jane Goodall visited in 2008, Patrick showed her rows and rows of incubating eggs: 11,376 at that time, with about 700 adults in the captive population. 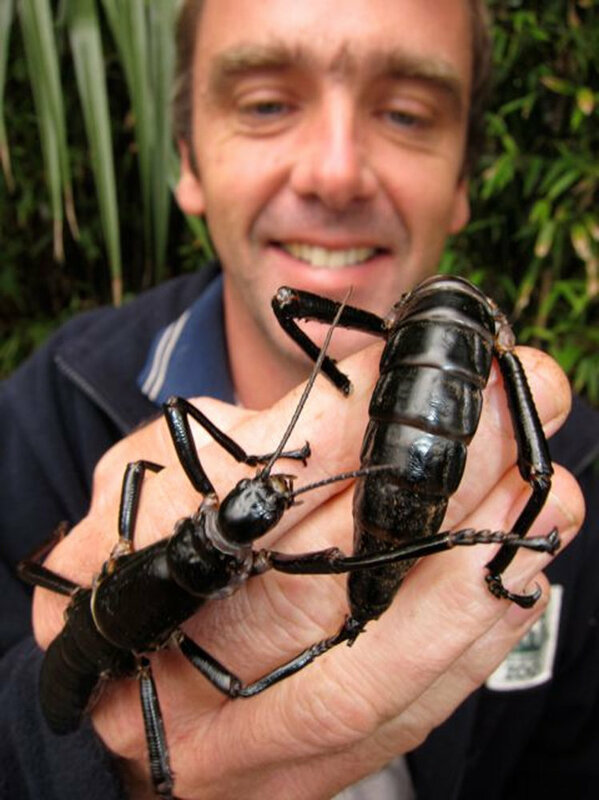 Lord Howe Island walking sticks seem to pair off — an unusual insect behavior — and Goodall says Patrick "showed me photos of how they sleep at night, in pairs, the male with three of his legs protectively over the female beside him." Now comes the question that bedevils all such conservation rescue stories. Once a rare animal is safe at the zoo, when can we release it back to the wild? On Lord Howe Island, their former habitat, the great-great-great-grandkids of those original black rats are still out and about, presumably hungry and still a problem. Step one, therefore, would be to mount an intensive (and expensive) rat annihilation program. Residents would, no doubt, be happy to go rat-free, but not every Lord Howe islander wants to make the neighborhood safe for gigantic, hard-shell crawling insects. So the Melbourne Museum is mulling over a public relations campaign to make these insects more ... well, adorable, or noble, or whatever it takes. They recently made a video, with strumming guitars, featuring a brand new baby emerging from its egg. The newborn is emerald green, squirmy and so long, it just keeps coming and coming from an impossibly small container. Will this soften the hearts of Lord Howe islanders? I dunno. It's so ... so ... big. But, hey, why don't you look for yourself? What happens next? 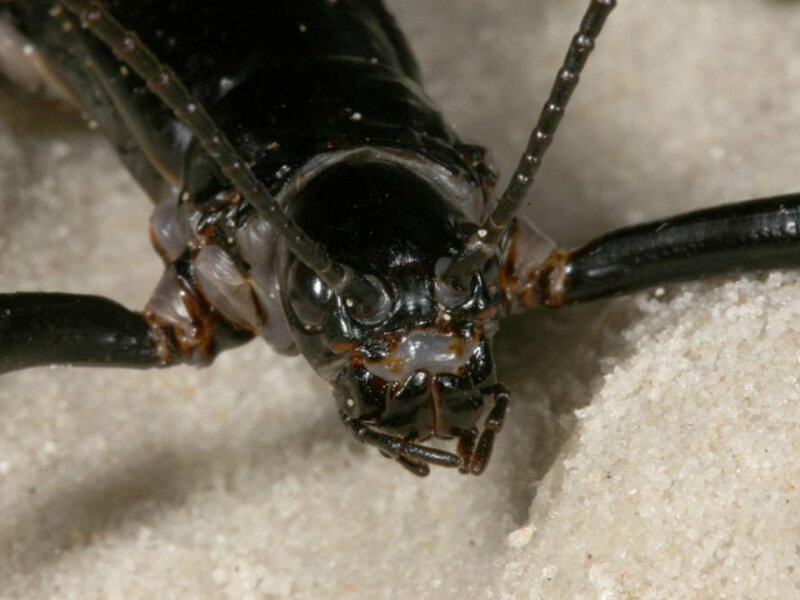 The story is simple: A bunch of black rats almost wiped out a bunch of gigantic bugs on a little island far, far away from most of us. A few dedicated scientists, passionate about biological diversity, risked their lives to keep the bugs going. For the bugs to get their homes and their future back doesn't depend on scientists anymore. They've done their job. Now it's up to the folks on Lord Howe Island. I'm still here. Don't let me go. Magnificent post, WADE. Thank you. Something sacred from the Creator is always made visible to us in the beginning of new life. And the breath of all mankind?" I am amazed at the devotion of these people to do something that is right…and accomplish the job under crazy rules. Meanwhile there are 15 coyotes roaming the area eating dogs and anything else. Worried about their bite size dog, his request to have the coyotes removed was denied on the grounds, “They were here first.” He replied, “So were the Indians.” Maybe ‘Dear Abby’ could tell him what to do. Wade, 1st..I HATE BUGS!!! The pictures gave me the willies!! I could not sleep last night and after reading your post had some interesting insights to an analogy for my spiritual journey.. There I was, a young believer. Enjoying hanging out with other like minded people. Basking in the SON and sun...like the Stick Insects. Then out of the blue one day a group of strangers needing help came. Seemed innocent enough. Until something they carried crept in to my life. In your story, it was black rats..but in my life it was the blackness of legalism. It quickly permeated and dominated what was good and right. Few escaped. There was a remnant who found a way to escape and in a very precarious place they found shelter. Very confining and limited, they found the ability to live together, work together and watch out for one another. Things looked bleak as their numbers were small but they kept doing what the knew to be right and good while below the black ravages of legalism ate and devoured not only their kin but eventually one another. Many years pass and finally help came to this small resilient group. Finally the tender loving gracious care allowed recovery. They had Patience and love, Wisdom and guidance. Once the little " band of bugs" were thriving,the blackness was addressed and removed. The remnant was reintroduced to their once dangerous dwelling place. If you allow the analogy... this was me. GRACE brought me back from the blackness of legalism to life lived in GRACE. A life filled with LOVE for Christ. I had people "STICK -UP" for me. People who prayed for me and came every so gently and lovingly help me get stronger and thrive in Grace. That was beautiful, Pege'! Thank you! Victorious... that was very kind to say...I thought it was quirky. I often have sleepless nights and after reading Wades article and seeing the bug pictures, I could not get the story out of my mind. I agree with Victorious - excellent! You've given me a great idea for a message! 1. Thirty-nine lashes five times. 2. Beaten with rods three times. 3. Prison more than once. 5. Faced danger from Jews, Gentiles, and false Christians. Off the subject is the persecution of a man who would not stop telling what he saw when President JFK was killed. This was written in the book, “LBJ and the Kennedy Killing”…2013 by James Tague who was wounded at Dealey Plaza. We became friends and I was at his funeral 4 months after his book was published. My staff said, "Why would anyone spend millions to save bugs?" I responded, "Why would God ever give His Son to save us?" I too love Page's story. I was in the same boat but Praise Jesus He chose to bring me into the light! Now people are trying to convince me that we can grieve God because the word says we can grieve the HOly Spirit...help? !